Fabian Cancellara makes some excellent points in this article by CyclingNews.com about the changed route of the 2012 Tour of Flanders (Ronde van Vlaanderen). I agree with him, almost to the point of feeling slightly guilty about being one of those many fans on the Kwaremont or Paterberg on April 1st to watch the race. But before the guilt sets in too deep, as Meryl Streep recently said in accepting her academy award for best actress after waiting years for the honor, "whatever." Cycling is indeed growing and changing, but it does not distract from the reason why so many of us truly enjoy the Classics more than most other races of the year - because The Classics come down to man against man, man against machine, man against cobble, man against the elements. The fans are just their to witness the fight in true gladiator fashion. It's usually Classic! Round and round they go - the last kilometers of the 2012 Tour of Flanders parcours. 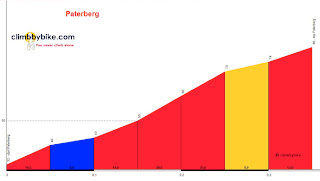 Go to this link (parcours) zoom in on the google map, and then click on each mountain icon to see the name, location, and details of each berg (or climb) in the 2012 Tour of Flanders. Very educational and fun for those of us who love maps and cycling and understanding what the riders will tackle on race day. 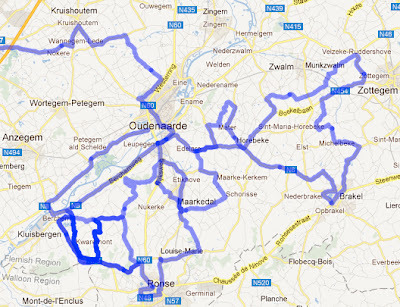 Look at this route (Brugge to Oudenaarde), if anything the fans are needed as directional road blocks, so the riders don't end up taking a wrong turn on this maze of roads! Can you imagine being inside one of the team cars - "Are we there yet?" "I'd swear we've seen that sign to Oudenaarde 5 times."